We're not sure where you stand on politics. Right wing; left wing. East coast; West Coast. Politics aside, we do know you love great deals and marketing giveaways from the biggest and brightest brands out there. Check this deal out from American Apparel. It's sure to be a controversy, and it's a pretty sweet bit of savings on your wardrobe. 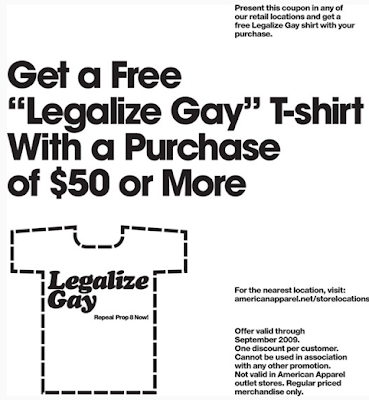 The new deal from American Apparel is for a Free "Legalize Gay" T-Shirt. American Apparel released the promotion on Twitter over the weekend, and it's caused a small stir among the politically active on the web. An even bigger stir for fans of American Apparel and great discounts, coupons, and promotions from the brand. If you're planning to make a purchase from American Apparel, and dig the idea of repealing prop 8 in California, you can act now for this free shirt. Receipt of the Tee requires you spend $50 or more, and it's only active for a limited time. What are your thoughts on Brands participating in controversial politics like this? We'd love to chat with you more on brands involved in politics below, or on Twitter (@qmania). Thanks and enjoy the savings! American Apparel is unusual in their overt display of support for progressive issues. They are helping us make headway - go AA!